I’m stepping out on a limb here with a short post that lacks both research and images. I am told it is illegal to wet your feet or wade in monumental fountains in Italy and as the temperatures in Rome soar these days more and more people are cooling off by doing just that. And the blogosphere and social media channels are overflowing with outraged Italians, many of them my friends, for whom this seems a great sin. I honestly don’t get it. If I make a list of things I see everyday in Rome, and put them in order of negative impact, wading in fountains is way off the charts (by which I mean, its importance is negligible compared to serious violations). I see huge dangerous motor vehicles speeding through red lights, double-parked on busy streets, parked in pedestrian zones. I see people throw trash out their windows onto public streets, drop cigarette butts on sidewalks where children are walking. I see invasive and crass advertising everywhere damaging the image of Rome, I see ugly mass-tourist commerce occupying spaces where previously there were artisans. It’s become difficult to cycle through the city because of all the huge tour buses and their huge tour groups that move as compact packs even when on foot. I see exterior air-conditioning units churning out hot air on protected buildings, such as the cultural superindendents’ offices. I am outraged by all of this. I also see some restaurants moving their tables out onto the piazza beyond the legal boundary, I see some residents hosting travelers “informally” in their homes to make some extra money, I see hot urban dwellers or visitors dangling their feet in the cool water of public fountains. I get it that there are regulations which should be respected, taxation and hygiene policies to enforce, and that’s fine. But I’m honestly not nearly so outraged by this latter behavior as I am about the list above. I’d rather see public cafe tables in the street than big private toxic fuel-consuming metal boxes (i.e. cars). I’d rather see people cooling their feet in fountains rather than burning fossil fuels to run eyesore air-conditioning units. Am I missing something? I like to respect local customs. I take off my hat when I go into a church, although I am not religious. If wetting one’s feet in a public fountain is really offensive to Italian culture, I’ll explain that to my students and suggest they take a cold shower. It’s just really hard to stand in front of a bunch of hot, well-educated students, after a day of detouring around cars on sidewalks and near misses as taxis speed through pedestrian crossings, past piles of trash, graffiti, beggars, pickpockets, scam artists and illegal sale of everything imaginable, and explain that they can’t put their feet in a fountain because it’s disrespectful. I’ll cross post to FB www.facebook.com/tomrankinarchitect in hopes of getting some input from friends. Addendum: lots of buzz, including this article by Jason Horowitz in today’s NYT. Dear Mr Rankin, your overview of Rome ‘s follies and vices is absolutely true and appalling. However, I would make a distinction between the dwellers’ shameful behavior infringing the right to a sustainable city and the tourists’unawareness that the marbles and stones in the eternal city are not eternal at all . On the contrary, they are very frail and can’t take the rubbing hands and feet . The former is a societal issue,the latter, just housewife ‘s common sense . What I question is this: How is it possible that people who grew up in the shrine of Beauty can be so common and coarse? 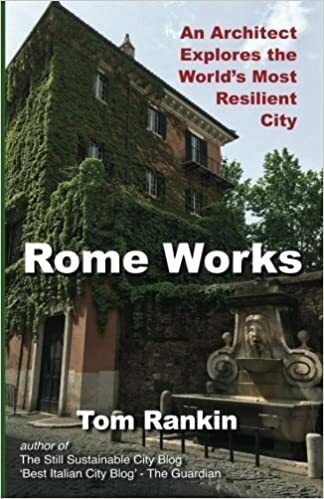 We loved much about living in Rome, but the failure to enforce laws/rules that could improve the city’s livability — as well as the carelessness of some individuals — became a constant topic of discussion and annoyance. The parking in pedestrian areas (especially in the strisce) particularly annoyed us as non-car owners. Enforcement of parking laws alone would make traffic run better, buses on time, and add to the coffers of the city. But no one seemed to care. If Paris can have on time buses, why can’t Rome? We miss many things about Italy, but revel in the orderliness of things in the U.S.
Don’t get me started on the way people take up a while sidewalk and fail to yield, or step out of a doorway without looking and run you down. You are brave to ride a bicycle. Tom,I’m afraid I have to agree with gli Romani. I get a little upset when I see young people, mostly tourists, mostly Americans cooling off in the fountains, especially Aqua Paola. I have to admit my reaction comes from some shameful behavior in my youth having jumped into the Trevi shortly after arriving in Rome in 1968. I hope I have recovered all the photos and if anybody asks I never did it. Tom, speaking of breaking the rules, I’ve noticed 2 new questionable changes on Viale Trastevere. One is a kiosk that has reopened near the Ministero dell’Istruzione, that has managed to block 80% of what was a very wide pavement. The second is a bar/deli on the corner of Via San Francesco a Ripa that has somehow managed to squeeze 4 tables on the pavement, again leaving almost no room for pedestrians, on what was already an insanely busy corner, mainly due to the bancarelle (who seem to do as they wish, but that’s another day’s complaining!). My question is: who is the relevant body I could complain to about the kiosk and the bar blocking the pavement? it’s Adriano Meloni, assessore al turismo e economia, olus the polizia municipale but they will di nothing.